Fears are growing the development of the East African Community could be undermined by the crisis in Burundi. 40,000 people have fled the country as protests continue about President Pierre Nkurunziza's decision to run for a third term. Kenya, Rwanda, Tanzania and Uganda have integrated Burundi into plans for projects, like a railway connecting the region with the port of Mombasa. The head of the United Nations refugee agency has expressed his deep concern. Speaking in Nairobi, Antonio Guterres said: "We are extremely worried. We have already more than 20,000 refugees in Rwanda. We have probably eight to ten thousand in Tanzania and probably four to five thousand in the Democratic Republic of Congo." Civil society groups say 13 people have died since protests began on April 26, although police give a lower number. On Monday the US Secretary of State, John Kerry, said he was "deeply concerned" about president Nkurunziza's decision to stand for office again. East African foreign ministers, have announced a crisis summit for next week, in Dar es Salaam, the economic capital of Tanzania. The member states of the East African Community have forged ahead with plans to boost the region's economy, aiming to create a single market. Multi-billion dollar projects, such as new roads, building a 1,720 kilometre rail line through East Africa to the export hub of Mombasa, or constructing an oil pipeline across the region, underline just how serious the EAC is about developing the region's economy. The Burundian capital Bujumbura is part of the trade routes the EAC wants to develop in the region. Notable EAC policies introduced in the last year to break down trade barriers include speeding up customs processes for goods in the Kenyan port of Mombasa, which are being imported to other countries such as Uganda. The bloc has also leaned on mobile phone companies to cut roaming charges. 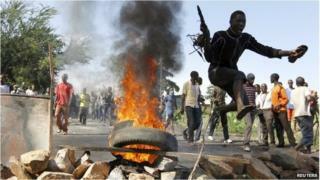 Burundi emerged from a civil war in 2005 and neighbouring nations are worried about the growing crisis. "We are expecting if the situation in Burundi gets worse there could some economic effect on Uganda," Nebert Rugadya, a business commentator in Kampala, told the BBC. "A stable Burundi means a lot for stability in the region," he added. François Conradie from the African economic consultants NKC has a stark assessment for foreign investors,"risk in Burundi should be considered very elevated," he warned. "The danger of a cross-border shock is also serious, especially as tensions a bit further north, in the region of Goma on the DRC-Rwanda border, are increasing," he said. "If matters unravel further in Burundi then the Hutu-Tutsi dynamics which informed its civil war will come to the surface again, and play a role in tensions in the DRC's Kivu provinces," he added. Economic growth remained stable last year in Burundi, at about 4.7%, driven by a rebound in coffee production and increased work in the construction industry. Exports of coffee and tea are Burundi's main foreign trade. However the development of nickel mining promises to enhance the country's economy. The mining group Kermas, which also has operations in South Africa, Germany, Turkey and Croatia, is concerned developments in Burundi could affect its BMM subsiduary which controls exploration rights for nickel, cobalt and platinum. "We feel extremely sad about this situation in Burundi," Kermas spokesman Kreso Raguz told the BBC. "For us, success of our projects also always meant success for our employees and their families, especially in an underdeveloped country like Burundi," he said. "Burundi's economy is something we are very interested in, as well as stability in that country and that is why we can only hope that a peaceful solution of these issues in Burundi will be found soon," he added. Since 2012 Burundi's economy has grown annually more than 4% and although the government's finances have improved the African Development Bank says the country is still faced with major constraints, due to the poor mobilisation of domestic resources and the volatility of external aid. Before President Pierre Nkurunziza revealed his intention to run for a third term the bank cautioned investors that "political tensions have grown in the run-up to 2015 elections", an assessment that, with hindsight, seems an understatement. The fallout of events in Burundi threatens to not only damage the country's economy, but have a wider impact on the region. No wonder the East African Community is suddenly so focused on its troubled member Burundi and much hinges on next week's summit in Dar es Salaam.